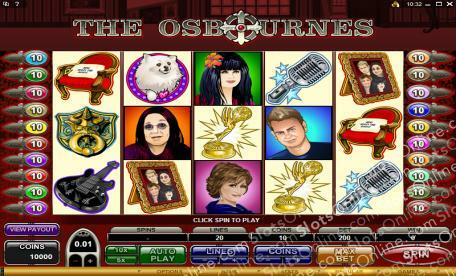 Join Ozzy Osbourne and family in The Osbournes slots, where the Dark Prince of Metal rules with an iron fist. Click here to play! Well, he would if he could remember where he put the iron fist. Mostly his lovely wife Sharon does the ruling and actually seems to have a stronger career in entertainment these days. But I digress. While, yes, Ozzy hasn't exactly been the most lucid man of the house in recent years (actually, his lucidity has been up for debate for most of his adult life, one would think), he does what he needs to do to provide for his heavy metal family. It's all one would expect from the Odin of Metal (though this position was arguably taken up by Ronnie James Dio, but again I digress...) With the Power of the Metal, Ozzy keeps his family in the lifestyle they have become accustomed to. You could win the sort of money you need to live like a rock star family by playing The Osbournes slots. With all your favorite Osbournes, including Sharon, Kelly, Jack, Ozzy and even their pet dog Mini, you'll have the time of your life playing these slots with one of the wildest families around! And best of all for Ozzy Osbourne fans - there isn't a single bat in sight. Mini the Dog symbols pay out as scatter wins, and they also trigger a special bonus game. Doorknocker symbols are also scatter symbols that trigger a bonus game. The Osbournes Logo symbol is wild, substituting for anything other than scatter and bonus symbols. There are three bonus games. One is randomly triggered, and in it you must try to stop on the gift of your choice, which will provide bonus winnings. Another is triggered by getting 3 or more Mini the Dog scatter symbols. In that, you receive 10 free spins at a 2 times multiplier and every Mini symbol moves Mini along a trail to each member of the family, who will reset the free spins back to 10 for every time Mini moves 5 spaces. The final bonus game is triggered by 3 or more Doorknocker symbols scattered across the reels. In it, you choose one of the Doorknocker symbols and get awarded a prize multiplier.